Simple Traffic Controller : Let us conider the operation of traffic lights controller. In this case when the red light is on and timer signals that makes green light should be glow (GO_GREEN signal goes to high state) and hence turns on the GREEN signal and makes off the other signals. When green light is on and timer signals makes the yellow light GO_YELLOW signal is in high state) makes on the YELLOW signal and makes other signals off. When the yellow light is on and timer signals that the red light makes the (GO_RED signal in high state) makes on the RED signal and other signals off. 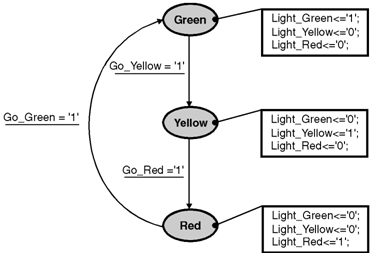 As an example, a State diagram for traffic lights controller is shown in figure below.